Now that the HIPAA Compliance Deadlines have been reinforced with random audits, compliance is more important than ever before. Healthcare providers have historically struggled to comply with the unique challenges that the new rules and regulations require. Not to mention, these rules are constantly changing! Documenting your HIPAA compliance with a formal, comprehensive HIPAA Manual is now mandatory for the healthcare industry. 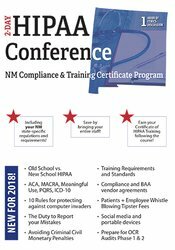 This 2-day conference will take an in-depth look into the world of HIPAA to make sure your practice is covering all bases and protecting YOU as well as your patients' information. Joseph Borich, MBA, JD, LLM, will engage and inspire you to be confident in your ability to take your HIPAA compliance program to the next level and to meet government standards. HIPAA Compliance Manual: What’s required, What YOU will need! Reporting Breaches: What is worth reporting? You'd be surprised. Define and evaluate the implications of ACA, MACRA, Meaningful Use and PQRS. Examine regulations focusing on 3 major issues in HIPAA: regulatory compliance, payment reimbursement, and medical malpractice. Review the HIPAA electronic transaction and code sets rules. Analyze the rights of the patient and covered entities. Appoint the privacy and security officers with duties and responsibility. Explain the most common mistakes made when using electronic billing. Assess how you can simplify the process and take cost-effective security measures. Outline Medicare and Medicaid fraud, waste, and abuse implications. Examine mandatory electronic medical records and billing - It is on the horizon! Be prepared. Discuss ethics requirements and considerations related to HIPAA. Who owns the medical record: the healthcare facility or the patient? How long are you required to retain records? Know what the bad guys are doing and protect yourself! How much do you charge for copies? What do the guidelines say? Record Retention Timelines (how long do you have to retain your medical records timelines?) How long do you retain paper and/or electronic? Joe Borich III, MBA, JD, LLM, has been a certified mediator, coach, consultant, author and a practicing attorney for over 30 years. He currently has his own firm in Kansas City, Kansas, where he provides legal, consulting and business coaching services nationally for the healthcare industry. Throughout his legal career, Mr. Borich has worked extensively in the area of regulatory compliance, payment reimbursement, and medical malpractice in healthcare related cases, serving as the defense attorney in the nation’s largest Medicare anti-kickback prosecution. Mr. Borich is focused on HIPAA compliance and has extensive experience in HIPAA Risk Analysis, Audits, Trainings, and consulting for hospitals, medical practices, the government, insurance companies, and business associates throughout the fifty states. He has also worked for the Department of Justice, the Supreme Court, and served as an Assistant Attorney General stationed in New York and Washington, D.C., He uses his experience and knowledge to deliver a complete learning experience. Mr. Borich will provide the necessary analysis and focus on HIPAA and how it interacts with current state and other federal laws. Financial: Joe Borich III is owner of Borich Healthcare Legal Consulting. He receives a speaking honorarium from PESI, Inc. Non-financial: Joe Borich III has no relevant non-financial relationship to disclose. PESI, Inc. is designated as an Approved PACE Program Provider by the Academy of General Dentistry. The formal continuing education programs of this program provider are accepted by AGD for Fellowship, Mastership and membership maintenance credit. Approval does not imply acceptance by a state or provincial board of dentistry or AGD endorsement. The current term of approval extends from 10/1/2015 to 9/30/2021. It is offered for 12.5 self-study credit hours. Provider ID# 217543. PESI, Inc. is designated as a nationally approved sponsor by the Academy of General Dentistry, which is recognized by many state dental or hygienist boards. Please check your state rules and regulations to determine if this self-study course meets your state criteria. Nurses completing these self-study materials will earn 12.6 contact hours. Expires: 9/20/2021. This self-study course consists of 12.5 clock hours of instruction that is applicable for physical therapists. CE requirements for physical therapists vary by state/jurisdiction. Please retain the certificate of completion that you receive and use as proof of completion when required. California Physical Therapists & Physical Therapist Assistants: PESI, Inc. is recognized by the Physical Therapy Board of California as an approval agency to approve providers. This self-study lecture qualifies for 12.5 continuing competency hours. Illinois Physical Therapists & Physical Therapist Assistants: PESI, Inc. is a Registered Physical Therapy Continuing Education Sponsor through the State of Illinois Department of Financial and Professional Regulation, Division of Professional Regulation. License #: 216.000270. This self-study course qualifies for 12.5 CE credit hours. New York Physical Therapists & Physical Therapist Assistants: PESI, Inc. is recognized by the New York State Education Department, State Board for Physical Therapy as an approved provider for physical therapy and physical therapy assistant continuing education. This self-study course qualifies for 15.0 contact hours. Texas Physical Therapists & Physical Therapist Assistants: This self-study activity is provided by the Texas Board of Physical Therapy Examiners Accredited Provider #2106032TX and meets continuing competence requirements for physical therapist and physical therapist assistant licensure renewal in Texas. This activity will provide 12.5 CCUs. The assignment of Texas PT CCUs does not imply endorsement of specific course content, products, or clinical procedures by TPTA or TBPTE. Full attendance is required; no partial credits will be offered for partial attendance. PESI, Inc., #1062, is approved to offer social work continuing education by the Association of Social Work Boards (ASWB) Approved Continuing Education (ACE) program. Organizations, not individual courses, are approved as ACE providers. State and provincial regulatory boards have the final authority to determine whether an individual course may be accepted for continuing education credit. PESI, Inc. maintains responsibility for this self-study course. ACE provider approval period: January 27, 2017 - January 27, 2020. Social Workers completing this course receive 12.5 Clinical Practice continuing education credits. Course Level: Intermediate. Full attendance is required; no partial credits will be offered for partial attendance. A certificate of attendance will be awarded at the end of the program to social workers who complete the program evaluation. Canadian Social Workers: PESI, Inc., #1062, is approved to offer social work continuing education by the Association of Social Work Boards (ASWB) Approved Continuing Education (ACE) program. Organizations, not individual courses, are approved as ACE providers. State and provincial regulatory boards have the final authority to determine whether an individual course may be accepted for continuing education credit. PESI, Inc. maintains responsibility for this self-study course. ACE provider approval period: January 27, 2017 - January 27, 2020. Social Workers completing this course receive 12.5 Clinical Practice continuing education credits. Course Level: Intermediate. Full attendance is required; no partial credits will be offered for partial attendance. A certificate of attendance will be awarded at the end of the program to social workers who complete the program evaluation. Canadian provinces may accept activities approved by the ASWB for ongoing professional development.